So, this has got to be the greatest way in the world to waste time! My little brother sent me this site and when you upload a picture of yourself, they will run “face recognition” to see which celebrities you look most like. Warning: Do not go to http://www.myheritage.com unless you have nothing else to do for the next couple of hours!!! When Shakespeare wrote, “What’s in a name? That which we call a rose by any other name would smell as sweet”, what he meant was that what matters is what something is, not what it is called. As true as this may be, it doesn’t make it any easier to actually have the responsibility to name something, or someone. Andrew and I learned very quickly that naming another human is a tricky thing! We still haven’t settled on a name, and I don’t know that we actually will decide prior to our little one actually making her arrival. However, since people keep asking if we’ve come up with a name yet, I figured I would at least let you know which ones are in the running for now. I’m sure the list will change over the next couple of months, but those are some of the names that we’re thinking about for now. This is something that you don’t see everyday in Atlanta…SNOW! So this morning we drove to the Lasik center for Andrew to have his Lasik surgery done. I must say that the office there was very impressive. Clean, modern, and they had a coffee machine with more options than Starbucks. 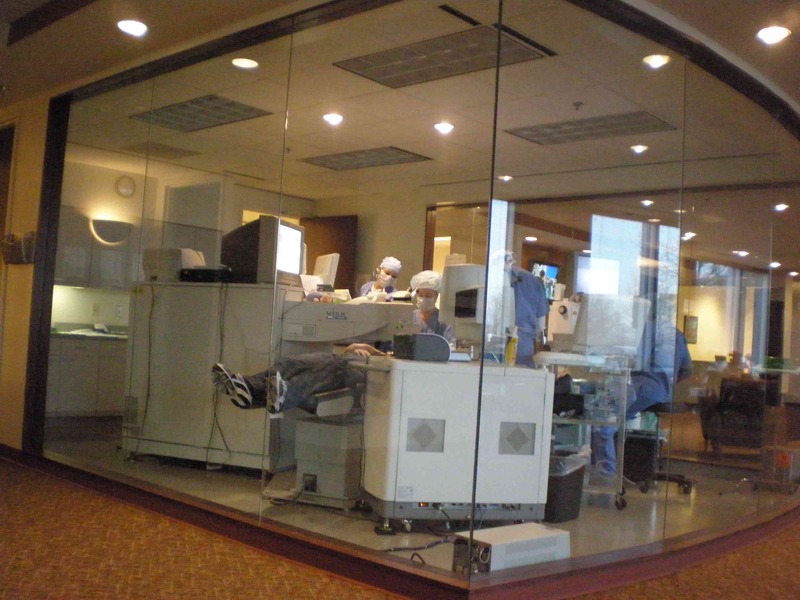 What I didn’t expect was the 3 sided glass operating room that jets into the waiting room for everyone to watch you as they slice and dice on your eyes. The cool thing about this set up is that it allowed me to take pictures to share with all of you! Here’s a picture of the “Fish Tank” (AKA: the operating room). 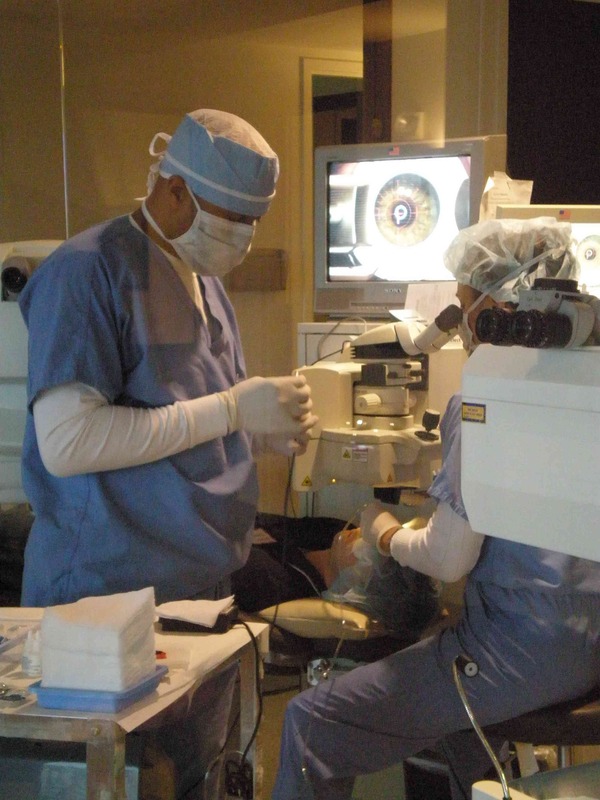 This picture is a close up of Andrew while under the knife…or laser. Be sure to check out the close up of Andrew’s eyeball on the computer screen. The entire surgery only took about five minutes! While I was in the waiting room there was a woman sitting next to me who was filling out the necessary paperwork in order for her to have the same procedure done. As they started doing Andrew’s surgery, you could she her getting a little pale. Then she got up, dropped the half filled out paperwork on the receptionist’s desk, and headed for the door. I heard her say, “This is too scary.” and then she was out the door. I guess some people just aren’t cut out for Lasik (pun intended). I will probably never have a fish tank because I am completely horrified of fish going belly up (this happens to be fresh on my mind because Jerry wants to put a fish tank up at work and I just know I’ll be the one to walk in and find the first fish belly up). I love drinking cranberry grape juice out of a wine glass. I love reading cookbooks from cover to cover even if I’m not looking for a recipe. I hate the smell of amoxicillin. I have the inability to leave the house while the dryer is running because I’m convinced that it will catch on fire as soon as I leave. My name means “Child of Christmas” and I was born on September 24th…do the math. Our clothes closet is organized by color. All shirts are hung in a “Roy G Biv” pattern. Now you know a little more about me. I’m off to tag some friends, but I’ll start with my friend Kristen since she’s pretty new to the blog world too!